We are a highly acclaimed Exporter and Supplier of VPL IC Tester (UICT). VPL IC Tester (UICT) is a universal IC tester, which is a table-top version, designed as a powerful tool for manufacturers, servicing engineers, R&D personnel to test a wide range of IC's of Digital, Analog, CPUs and RAMs. Tests most of the 6 to 40 pin ICs in DIP package. The list includes 74/ 54, 40/45, 93/96 series ICs, EPROMs, RAMs, peripheral ICs, microprocessor (8088/8085/Z80/6502), operational amplifiers, voltage comparators, transistor arrays, optocouplers, analog switches, voltage followers, timers, A to D converters, D to A converters and miscellaneous analog ICs. Potential free 20 pin ZIF socket for testing analog ICs and 40 pin universal ZIF socket for testing digital ICs are provided. 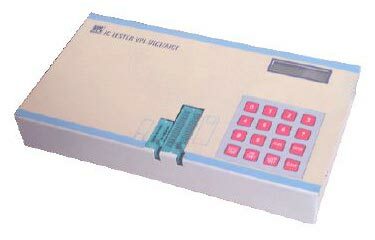 16 character x2 line LCD dot matrix display and 16 keys keyboard for man to machine communication and easy operation. Single step mode enables the user to test the IC step by step. Self test facility to test the internal modules of the IC tester automatically at power on and also through 'SELF TEST' key of the keyboard. IC Pack : Digital ICs up to 40 pins and analog ICs up to 20 pins in DIP package. IC Type : Tristate, open collector & bidirectional TTL/CMOS digital ICs also analog ICs as per list. Test By : Truth table comparison for digital ICs. Functional test of output for various input conditions for analog ICs. ZIF : 20 pin DIP ZIF for analog ICs and 40 pin Universal ZIF for digital ICs.